Commit code to Git, SVN or Team Foundation Server. We integrate, build, security scan and deploy your site. Play like the big boys with an Agile deployment pipeline. Free to Get Started. No hidden fees. Cancel anytime. 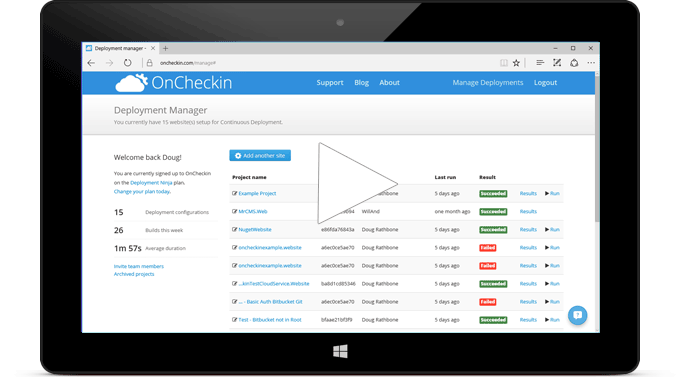 Continuous Delivery toolchain without the cost of managing your own build server. From signup to first deployment in under 5 minutes. We know that your time is most productive when writing code. To get up and running, all you need to do is tell us what web.config transform you want us to deploy for your remote deployment environment. Our beefy build servers make building the biggest solutions lightning quick, and with enough bandwidth to deploy just as fast. All customer code and data is securely store using PCI compliant bank grade encryption, keeping your build logs and credentials away from prying eyes. Our project dashboard gives you the power to easily review past deployments, promote changesets, and trigger manual builds. We work hard to keep your team productive. That includes around the clock Phone and Skype support. Keeping you building 24/7. Our service works with all your current frameworks and tooling. Whenever you check in to your source control, our system fires into action and securely downloads your project’s latest changeset. We support all your favourite source control providers (Git, SVN, TFS). Our service builds, tests and deploys your website or webservice with an absolute minimum of configuration. Get set up in under 5 minutes and deploy using WebDeploy, FTP, FTPS and SFTP. Why waste time writing build scripts when you can have continuous integration without the fuss? Unit tests, web.config transforms, security scans, build pipeline promotion and more. OnCheckin makes every day Release day.